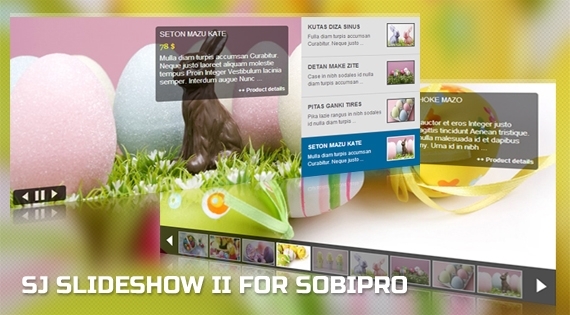 SJ Slideshow II for SobiPro supports displaying SobiPro entries in slideshow, along with a dedicated navigation panel that can be placed flexibly right, left or horizontally under the large main image. With 5 different themes and 30 effects to be chosen, we can tweak this module to have different layouts of navigation buttons and illustrative images. This module allows to configure speed and interval of sliding as well as choose one from 4 modes of re-sizing images. Beside large image, title and description for each entry; this module also allows to customize information of navigation panel... Let install and use SJ Slideshow II for SobiPro to utilize an lustrous slideshow with so many options such as showing OR hiding title, description, links.. that can be tweaked inside admin panel.